Author: BURROWS, MRS. E.] HERE BY THE AUTHOR OF "TRIUMPHS OF STEAM", "OUR EASTERN EMPIRE", "TINY STORIES" ETC. 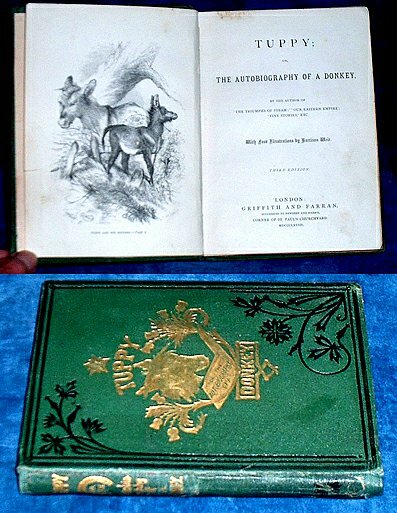 Description: London, Griffith & Farran 3rd edition 1868 Plates (4) by Harrison Weir engraved by John Greenaway. . Octavo green gilt pictorial cloth with donkey's head + thistles to top cover (rebacked with old spine relaid) 100pp +32pp catalogue (Osb.329 has h/c plates).